We love hearing what our guests say about their experience here at Sailcone’s Grizzly Bear Lodge. Do you have a comment to add? Please click here to send us your feedback. Finally we made our dream come true to visit the beautiful British Colombia! The best and most enjoyable holiday of our five and a great experience for our children Gregory and Elenoria. Thank you for your hospitality and the time you spent together. A special thank you to Madeline the best cook in BC and to George who worked so hard to find all for us. You line in a special and wonderful place!! The extra day at the lodge includes a visit a very scenic and very wild area on a pristine river. The day will give you an opportunity to do a little wilderness fishing if you are so inclined, a little hiking and always a chance to see a grizzly bear. The view from the deck of “Trapper Rick’s” cabin is stunning. 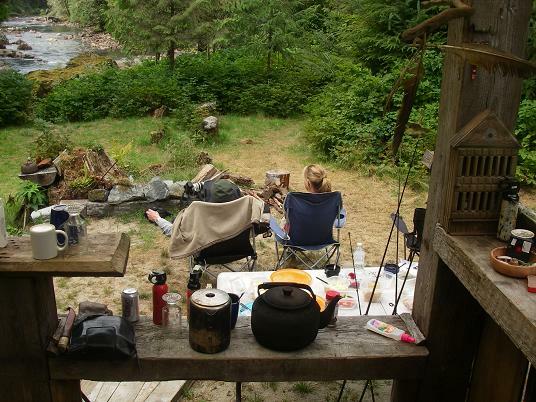 After some time up river and a short hike to Rick’s cabin a break was to just sit, chat and relax.